Hi, This is Daniel with 3rd Day Stone Restoration. We are in the cleaning and restoring business. We love what we do and therefore we strive to be the best that we can be. We can clean and seal many different types of floors and love the restoration process of natural stone such as marble, travertine, and terrazzo. What can I expect from a professional stone cleaner in San Antonio, TX? 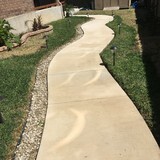 Find a San Antonio natural stone cleaner on Houzz. Narrow your search in the Professionals section of the website to local stone cleaners in San Antonio, TX and read reviews and ratings to find one that fits your needs.